As an intermittent snorer, it can be tricky finding a remedy. Many devices, such as mouthpieces and anti-snoring pillows can be intrusive, which make it difficult to fall asleep. This is an inconvenience for those of us who only snore at certain stages of our sleep cycle. Choosing which snoring mouthpiece to wear requires trial-and-error. The SnoreRx, Zyppah, and zQuiet devices all have pros and cons, and one may work better for you. To track which device is most successful, you need an app. You could end up buying an anti-snoring device which is comfortable and cheap but doesn’t work to decrease snoring volume. Using the SnoreLab can help you decide which snoring aid to wear consistently. With many sleep apps now available on the market, it has never been easier to keep an eye on your sleep patterns and identify trends in your sleeping habits. 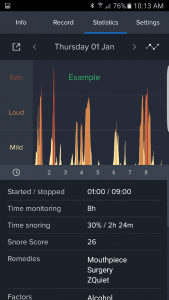 The SnoreLab App is one such tool, with the difference being that this app is designed specifically to monitor your snoring. This allows you to pinpoint exactly at which stage of your sleep cycle your snoring hits its highest levels, and allows you to effectively test out anti-snoring remedies. The SnoreLab App is particularly useful for those who sleep alone. Stopping your snoring may not seem like a top priority, but labored breathing significantly impairs your quality of sleep and makes you less alert during the day. Finding a way to ease your breathing in the night will have a surprisingly noticeable impact on how good you feel the next morning. So, the big question is, does it work? As the biggest and most popular snoring app on the market, with over 1 million downloads, I was optimistic for the SnoreLab App! So, I decided to take it for a spin, to see if I could learn more about my snoring patterns. The SnoreLab has lots of settings, allowing you to factor in daytime activities and try out different remedies, giving you a highly detailed and tailored user experience. You can also adjust the sleep time, depending on how long it typically takes you to doze off. It was quick and easy to set up, which I did in a few short minutes before placing it on my bedside table and settling down for the night. The next morning, I eagerly went to check out my graph, which gives a fantastic visual representation of how things went throughout the night. This informed me that I am a moderate snorer, and loudest when in my deepest sleep phase. I was pleased to see that the microphone had only picked up on my snoring, and not the background noise of my fan running, giving me a clear and accurate reading. The app also recorded the snoring, allowing me to listen in (though only for a few seconds with the free version), which was a little disconcerting! One limitation of the free app is that you can’t track your snoring over time, and as my goal was to test out different snoring devices, this was a drawback. The Premium version of the app is priced at $4.99, and offers a whole host of extra features that make it worth this small fee. For this price, you can track your snoring over time and make comparisons between various snoring devices, and this is where the app really comes into its own. The graph display is simple to understand and nicely detailed, meaning you can see at a glance how loudly you were snoring, and whether the device you are using helped in any way. You also have unlimited usage, compared with an allowance of only five consecutive sessions when using the free version. Another neat feature of Premium is Soundscape, where you can play background ambiance to help you doze off. The built-in alarm clock is also a nice touch, as is the reminder to charge your phone before you sleep, and of course, a lack of advertisements is always welcome! Effectiveness: I love how easy to use and informative the SnoreLab App is, and it’s a great way to keep track of your sleep patterns. I found it an extremely useful tool for testing out anti-snoring devices, but those who have trouble sleeping would also benefit, as you can work out what external factors may be preventing you from dozing off. 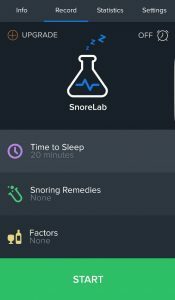 Price: I have gotten a lot of use from my SnoreLab App, and the premium version has so many extra useful features that $4.99 is a small price to pay for such a profound improvement in my quality of sleep. Clinically Recommended: The SnoreLab App is approved by doctors and often recommended to patients with sleep problems, which is a great endorsement, and proof of the app’s success in helping people address their nighttime troubles. Design: The interface of the app is visually pleasing and very easy to use, making for an overall pleasant and stress-free experience when selecting settings and checking out your graphs. Good Recording Playback: This is only available on the paid version of the app, but gives a good clear audio recording if you want to listen in on your snoring. Score Snore: The Score Snore awarded each night is given as a numerical value, which I guess is an overall rating of how loud you were during the night. However, this isn’t clearly explained on the app, so a little more information would be good here. Poor Customer Service: I contacted customer service to inquire about the Score Snore, only to hear nothing back. This hasn’t detracted from my experience of using the SnoreLab App in any way, but for a product that is so widely used, it would be nice if they improved their communication with customers. No Choice but to Upgrade: The free version of the app provides a good introduction with limited functionality, an example of what the full version provides. It is useful in deciding whether to use it on a regular basis but isn’t suitable for long-term use. To track your sleep patterns, test out anti-snoring devices, and learn more about which aspects of your lifestyle are impairing your quality of sleep, the Premium app is a must-have. The SnoreLab App was an excellent purchase for me and is an effective and inexpensive way of finding the underlying cause of how to alleviate my labored breathing during the night. Our quality of sleep impacts our health in so many ways that this is the ideal way to tweak our daily habits and routines in a way that is well informed and proven to deliver great results. App Store Ratings at the time of this review. Product: With over 1 million downloads, SnoreLab is the biggest and most popular snoring app on the market.